What’s been remarkable about Operation Thin the Herd is the clarity it’s bringing me about what I want my photographic future to be. That future is SLRs from Pentax and Nikon. They strike that right balance among image quality, usability, and reliability. Also, SLR shooting just suits me. Canons are usable and mostly reliable, but the images I get from them seldom wow me even though they are technically very good. Minoltas deliver wonderful images and feel great in my hands but I’ve had too much trouble keeping them working. The few SLRs I own from other manufacturers are all fine in their ways, but I know I won’t use them enough to justify keeping them. I’m going to keep a couple medium-format cameras, too, especially one of my Yashica TLRs. Good gracious, but do I love those things. I will also keep a handful of other cameras that I enjoy or that have sentimental value. I’ve already committed to keeping my Olympus XA, for example — it’s a stunning performer and slides right into a side pocket. I’m sure to keep one of my big fixed-lens rangefinders, too; maybe my Yashica Lynx 14e if I can get its meter calbrated. Even though I haven’t shot it yet as part of this project, I’m betting I’ll keep my Argus A-Four, too. Its lens does lovely black-and-white work, and I have a wonderful memory from my high-school days of shooting a roll of Plus-X in one of these and then processing it in the school’s darkroom with a buddy. I don’t know how far I am through this project but it doesn’t feel like I’ve hit the halfway point yet. Fatigue is starting to set in — I want to just get on with shooting my forever cameras. As a result, I am now more likely to say goodbye to a camera when I do shoot one — or even to sell one on without shooting it again. So . . . Things are coming into focus? As much as I enjoy reading about some of your more unusual cameras, I understand completely how you can be ready to zero in more on that thing that makes you happy. wakka wakka – Keep your day job! It made me happy for four decades to just accumulate cameras, but now I really mostly want to make good photographs — and get rid of the boxes of cameras that clutter my bedroom. 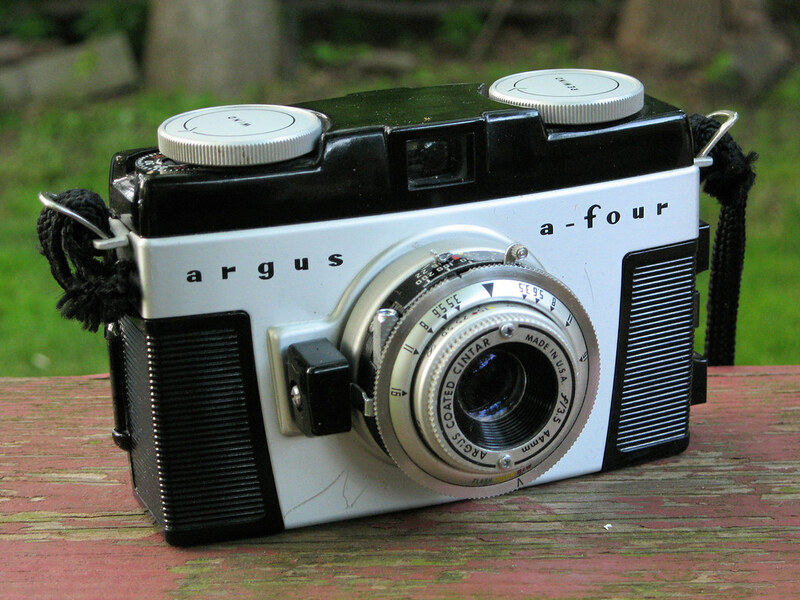 The Argus A Four was designed to compete with the Kodak Pony. The Pony had a faster shutter speed and a simpler flash connection. It is also cheaper on Ebay. I’ve found the process of culling my camera collection cathartic. Like you, Nikon and Pentax have come into favorite positions, although I really like my Minolta XD and Contax RX. On the other hand, I know from experience that I won’t miss any of these cameras after they’re gone. I’ll be too busy and happy shooting my Pentaxes and Nikons! I have just really enjoyed following along with this series. A part of me marvels a bit at how many cameras you have :) I just couldn’t. Thank you! Until about five years ago I considered myself a camera collector, not a photographer. Now I’m a photographer who loves vintage gear, but wants to keep just the gear I’m likely to use. Ok, well that make a lot of sense. Good going Jim. I am focusing my efforts on a few cameras now selling/sold some that I just don’t see myself using or don’t look nice enough to keep. The Voigtländer collection stays but anything else is being reviewed. With my recent acquisition of a Prominent and a Superb I am happy I have my perfect range of shooters. I have one more Voigtlander in my collection that I haven’t shot yet as part of this project, a Vitoret LR. Suuuuuuper contrasty lens. It’s similar enough to my Zeiss Ikon Contessa LK, which I’m keeping, that I don’t need both. I need to enter another round of herding thinning. My love for the a-four may be entirely based on nostalgia. I’ve said it before, but I think the A-four is underrated. It is not in any way a great camera, but a nice example is a pretty good camera, and I think that’s more than most people expect from it’s apearrence. Exactly right. Way better than a box Brownie of any kind. However, this thing was far more expensive than a Brownie, at $32.50 in 1954. That’s like $300 today.